WIGeoStreet provides the optimal map visualization for your GIS analyses. The vector map WIGeoStreet is based on the MultiNet database of the navigation data provider TomTom; Based on this geodata, WIGeoStreet covers practically all of Europe. All the data is available locally for use in your company environment without the need for an interface for any external map services. Thanks to the exceptional depth of information and the attractive layout of the digital map, you will enjoy optimum orientation at any scale. WIGeoStreet is available in a variety of preset layouts. Thus you can quickly visualize the geodata as a gray scale, B/W or color map. 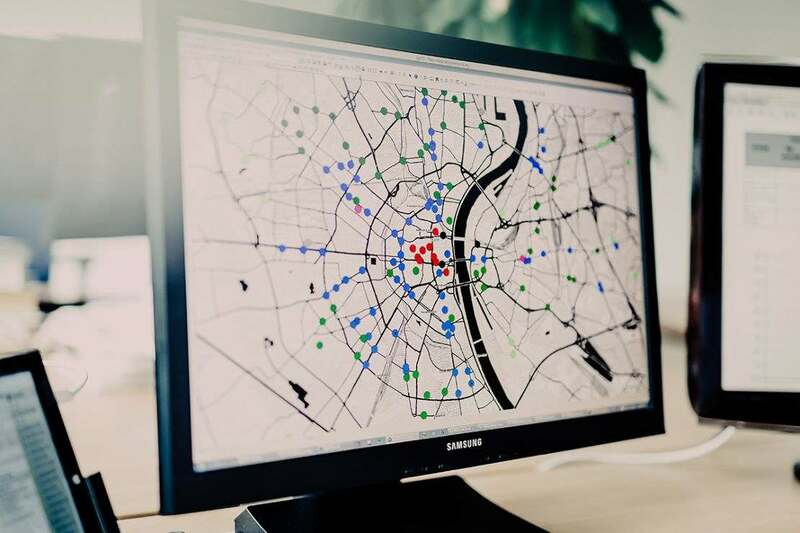 A custom version for ArcGIS is specifically tailored to the Maplex capabilities of ESRI. WIGeoStreet vector maps are suitable for every application where the display of detailed and accurate spatial information for an entire area is necessary. WIGeoStreet can be used in geographic information systems, operations control systems or internet applications. Each individual layer of the WIGeoStreet digital vector maps can be used for spatial analyses, be it the road network for network analyses or administrative borders for assessing potential. The geometries serve as the basis for individual data collection. Thus you can integrate your own zones within existing borders. The geodata is updated once a year. Thanks to the TomTom database, the WIGeoStreet digital vector maps are guaranteed to provide up-to-date, quality information. In addition, advanced geoinformation can be supplemented in vector form, for example with precise address points and traffic information. Market data from other suppliers can be linked to the geometries. If required, WIGeoStreet digital vector maps are also available in a raster format. We will be happy to provide you with a comprehensive, non-binding consultation. For which countries is WIGeoStreet data available? WIGeoStreet is based on the geographical raw data from TomTom (MultiNet) and their global coverage. The standard WIGeoGIS offer includes all the European countries. If required, individual packages can be created for any of the countries available in TomTom. How much disk space does WIGeoStreet require? WIGeoStreet for ArcGIS is provided as a compressed file geodatabase (FGDB). The compressed data currently requires about 1.2 GB for Germany, 250 MB for Austria and about 350 MB for Poland. The range of data required is similar for other countries with comparable sizes and populations. In which data format is WIGeoStreet provided? WIGeoStreet is provided in an ESRI vector format file geodatabase (FGDB) and already includes defined layer files for convenient loading of individual layers including the visualization requirements. This allows you to quickly prepare finished maps for use on desktop PCs, server applications and even mobile devices. What are the advantages of WIGeoStreet over web-based map services? WIGeoStreet is installed locally, so it is not necessary to access external services. This offers advantages in terms of data security as well as performance. The local data installation allows maximum flexibility in terms of the desired viewing options (show or hide individual layers, customization of the color design, projections, etc.). All the data can be processed according to GIS standards and can be used for the collection of additional data. Thus you can integrate your own zones within existing borders for example. Is WIGeoStreet suitable for producing high-resolution printouts? Yes, it is perfect for high-resolution printouts. Since WIGeoStreet is vector-based, it is possible to create large-format, high-resolution printed maps, e.g. with ArcMap or ArcGIS Pro, that can then be printed or plotted. At any time during the process you can hide individual map elements or change how they are displayed. Is the WIGeoMap raster map still available? Yes, WIGeoMap is still available. However, there are now a number of other possibilities to better create raster maps and integrate them into GIS systems. For example, the Tile Cache toolset for ArcGIS for desktops/servers and the open source solutions GeoWebCache or Geopackage. So-called “vector tiles” offer the best of the vector and raster worlds and are a very attractive display option, e.g. for ArcGIS Pro. Please contact us if you are interested in raster maps for your applications.